The North Carolina Department of Transportation opened to traffic in December the first section of the future U.S. 70 Goldsboro Bypass in Wayne County. The 3.9-mile, four-lane divided highway is temporarily designated as N.C. 44. 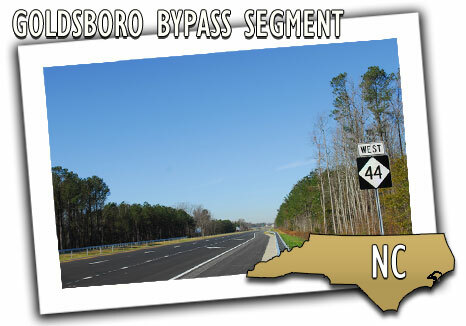 It connects Interstate 795 and Wayne Memorial Drive north of Goldsboro. Work was completed 3.5 months early and the $65.5 million project came in about $2.9 million under budget, according to NCDOT. A contract was awarded to Barnhill Contracting Co. of Tarboro in September 2008. The contract for this project was funded through the use of Grant Anticipation Revenue Vehicles, commonly referred to as "GARVEE bonds." The bonds allow acceleration of federal funding to help NCDOT finance projects sooner and avoid cost increases due to construction inflation. This is the first of three sections of the U.S. 70 Goldsboro Bypass to be constructed. Once complete, the 20-mile bypass will begin at U.S. 70 just west of N.C. 581 in Wayne County and end at U.S. 70 just east of Promise Land Road in Lenoir County. The estimated cost for the entire project is $246 million. North Carolina Transportation Secretary Gene Conti awarded this week a design/build contract for construction of the next section of the U.S. 70 Goldsboro Bypass. The $104 million contract was also awarded to Barnhill Contracting. Design work will take place first, with construction beginning at the end of 2012 or early in 2013. Completion is scheduled for no later than July 1, 2015. The project includes plans to construct the next 12.5 miles of the four-lane divided highway. The final section of the U.S. 70 Goldsboro Bypass from west of N.C. 581 to I-795 is currently scheduled to be awarded in June, with construction beginning later this summer. Photos of the bypass' completed first segment are available on NCDOT's Flickr gallery at bit.ly/NC44pics and more information is available at bit.ly/NC44open.